Wounded Breath is a collection of five electroacoustic works by renowned Turkish composer Erdem Helvacioglu. The works on this album each explore the capacities of sound design that is the hallmark of the current state of the art of electroacoustic music composition. The works on the album have received prestigious prizes from elektroacoustic music competitions such as Luigi Russolo, MUSICA NOVA and Insulae. All of these works have been performed at festivals alongside with composers like Paul Lansky, Christian Fennesz, Denis Smalley. 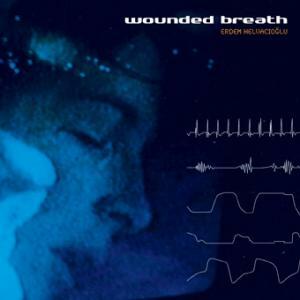 "Wounded Breath" album was included in the "BEST ALBUMS OF SPRING 2009" list on Culture Catch magazine. “Wounded Breath will open you up to new experiences and allow you to explore worlds previously closed to you. What other piece of music could evoke all those sense memories? None that I've listened to or heard before, but that's exactly what Erdem Helvacioglu is able to do with his music." "Five tracks cover over an hour of musique concrète with a quality that is quite rare." "Without the supplemental storylines, Wounded Breath would likely leave the impression of the auditory internalizations of a madman, but once the scenarios are introduced, Helvacioğlu’s genius can be realized."